The Real Deal is an easy-to-implement, “plug and play” program. It engages students in cognitive exercises for learning to recognize and correct thinking errors that lead to dysfunctional behavior, active practice of social-behavioral skills through role-playing, and participation in progressive muscle relaxation exercises. The program features three training videos: Takin’ It, Givin’ It, Workin’ It Out, that teach specific skills for controlling outbursts and achieving functional outcomes. Each video shows vignettes of adolescents dealing successfully and unsuccessfully with conflict situations, as well as scenes of actual group training sessions in which students discuss and role-play real life situations. 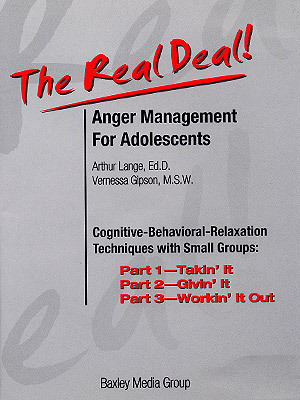 Two group leaders are shown working with the students as they practice the anger management skills and relaxation procedures. Built into the program are opportunities for your viewers to discuss and role-play conflict situations from their own lives. A self-relaxation audio CD featuring six different scripts with male and female narrators comes with the curriculum. Includes Free Leader’s Guide, Quick Reference Guide, and Set of 24 Skill Cards for student use in participatory activities.